The Honda EM10000 generator will be available in Australia from February 2017. Honda is set to release the EM10000 industrial generator onto the Australian market in February 2017, in response to increased demand for high-powered portable power solutions. 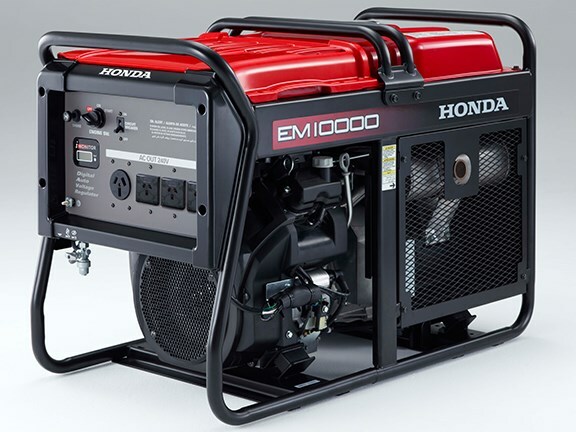 The Honda EM10000 delivers 9000W/ 240-V AC, and is designed for use on farms, construction sites, warehouses, and a back-up power source on residential properties. Honda says the EM10000 has the best fuel consumption in its class, with a 31-litre fuel tank that allows it to run for six and a half hours at 8000W. It features Honda’s i-Monitor display, which allows the user to view engine readings and output voltmeter, battery voltmeter, oil level and error coding information. Other aspects of its design include improved crankcase rigidity and a durable crank shaft. The large smooth flow exhaust assists in reducing the noise level with a unique muffler configuration, so that this generator can be used where strict sound restrictions apply. A centralised muffler also draws cold air over engine components, which reduces the likelihood of the unit overheating. The EM10000 generator costs $5990, and will be available via Australian Honda power equipment dealers in February 2017. If you're looking for used generators for sale, check out our listings.